CAPCOM | Capcom Street Fighter League Powered by RAGE Culminates in Roaring Success! Capcom Co., Ltd. (Capcom) today announced that its Japanese esports league, the Capcom Street Fighter League powered by RAGE, has reached its conclusion, capped off with a successful Grand Finals event held in Akihabara, Japan on March 21. The Capcom Street Fighter League powered by RAGE ran from February through late March of this year, and featured world-class pro players (official Japan eSports Union license holders) who took on the role of team leaders, drafting amateur- and beginner-level teammates who then competed together in 3-on-3 team battles. A total of six teams did battle across 10 rounds, which aired on AbemaTV and OPENREC.tv. The streams garnered high viewership through proactive use of social networking sites, and by featuring a renowned commentator, analyst, MC as well as special guests. Itazan Ocean, the team that held first place during league play, went on to win the Grand Finals, with the event not only broadcast live online, but also featured at live public viewings, such as at the company's Plaza Capcom Kichijoji store and in the city of Sendai, Miyagi prefecture, bringing play to an excitement-packed conclusion. Further, as part of Capcom's endeavors to build an esports ecosystem in Japan that supports a wide breadth of athletes--from absolute beginners all the way up to pro players--in early summer 2019 Capcom plans to hold the Street Fighter League: Trial, aimed at athlete development, as well as the Street Fighter League: Pro-JP, where professional athletes can compete. 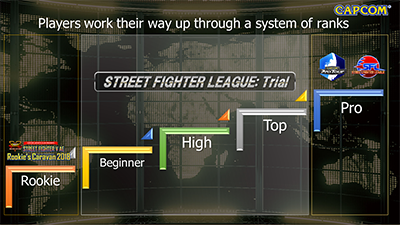 Through the Street Fighter League: Trial, Capcom will provide an environment where esports beginners and amateurs can sharpen their skills as they work their way up to the pros. 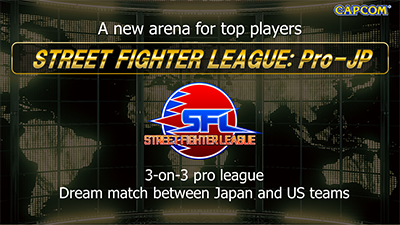 Further, as the premier 3-on-3 Japanese league, the Street Fighter League: Pro-JP will function to accelerate growth of the domestic esports market by providing world-class professional athletes with a space to shine, as well as with a dream match between the winning Japan team and the winner of the US-based Street Fighter League: Pro-US. Capcom is committed to promoting industry development through building an environment where esports fans and competitors alike can enjoy the thrill of competition, while establishing systems to further expand Japanese esports within the rapidly growing esports market.